Zagreb, Yugoslavia. Language: Serbo-Croation. Publisher: Zagreb Theosophical Society of Yugoslavia. 1/1, July 1927. 8-24 pp. This was a fairly standard local journal of the Adyar Theosophical Society. Theosophy came to Yugoslavia through an art exhibit presented by Alice Adair of Adyar in Belgrade and Zagreb in 1926. 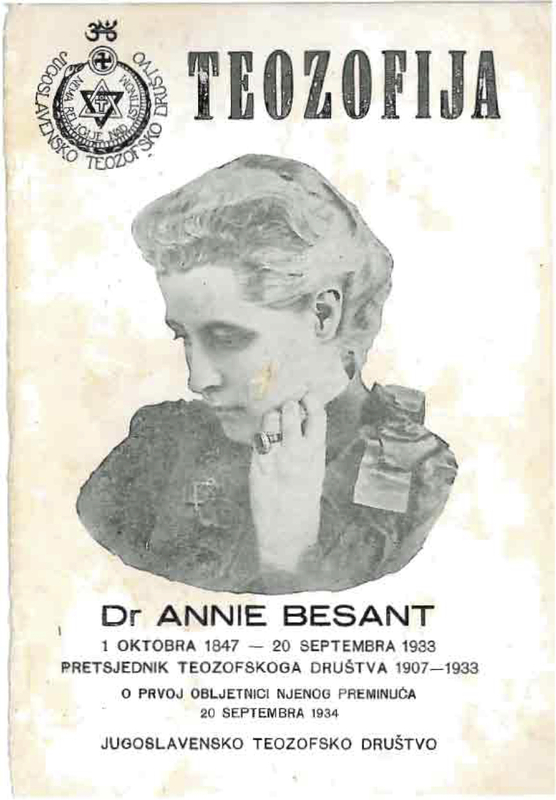 Contributions by Annie Besant, C.W. Leadbeater (whose “Authentic Biography” is printed in the journal), George Arundale, C. Jinarajadasa, et al. From Nemanja Radulovic: Official journal of the Theosophical Society of Yugoslavia. Translations of Theosophical articles, reports on happenings in world Theosophy, reports on the work of local lodges, in Croatia where the Society was the most active. Thematic isues (100 years from the birth of Blavatsky and Olcott; death of Leadbeater; death of A. Besant; new president Arundale; death of King Alexander of Yugoslavia; 60 years of TS). National and University Library in Zagreb (I, 1,1927-IX, 5-6, 1936); National Library of Serbia 1927-1930; 1932; 1937; Historical Archive, Ljubljana, 1927-1937; issues I, 4, 1928 – IX, 5-6, 1936, at: http://www.jivatma.si/gradiva/starejse-revije-casopisi/revija-teozofija.